One of the many facets of the Italian male stereotype is that of their ability to get away with wearing extremely short shorts. If there was ever somebody to prove that rule, then Giansanto takes the cake. It was in a small campsite outside of the industrial port town of Pozzallo in southern Sicily that we met Mr Santo. It was here that he, his friend, his small swimming trunks and unfeasibly tiny arse all celebrated a weekend away in a tent together. And it was here we were to have our first taste of the zest and enthusiasm that was to characterise our onward journey. At his point, we were still unclear where I route was to take us, only that the direction was to be North. We did know, however, that despite the pizza-sharing, yoga-doing, tree-climbing fun enjoyed in its relative vicinity, Pozzallo as a destination in its own right does not come highly recommended. The beaches are reasonable, the people friendly and the water clear, but it was not with a heavy heart that we bid the place farewell. It was now we would find out: had our plan to hitch-hike the Med been a misguided and foolish one? We had been standing on the side of the road in the heat of the midday sun for sometime and were starting to lose heart. We had been warned that it would be difficult to get a lift on Sicily and that people didn’t pick up hitch-hikers. It was looking like the naysayers has been right. Just moments later, however, a battered saloon overladen with people and beach paraphernalia screeched to a halt a few yards in front. Music blasting, there was clearly no room for two extra passengers, especially passengers with two large backpacks. Yet the driver, a middle-aged man who seemed to be on the verge of crying with happiness at the prospect of his new cargo, was making every effort to accommodate us. Where hand gestures had been sufficient to handle the logistics, once safely wedged between a cool box and an adolescent Sicilian, the question of how to approach more sophisticated level of communication became apparent. My Italian is nonexistent. Yet, against the odds, some semblance of conversation was had and enjoyed on both sides. So thrilled was our driver by the turn of events, in fact, he looked at the road three or possibly four times, preferring to turn round and grin at us for minutes at a time. 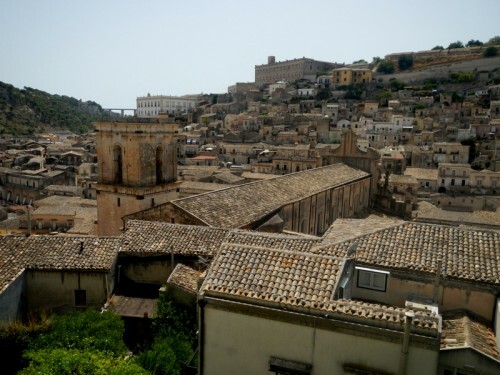 Our planned destination was the historic city of Modica in the Hybalean Mountains, a UNESCO World Heritage sight. * Not content that we should have to make our own way onto the next town later that afternoon and thus find another lift, our family man — with respective offspring in tow — returned later that afternoon to collect us. We were on a high. Not only was hitching here possible, it was first-class in nature. *Do not pass through without a visit to the small Osteria dei Sapori Perduti for a traditional pasta and glass of wine.